Your crooked, crowded, and gapped teeth have bothered you for years, but you haven’t done anything about them because the last thing you need is a mouthful of metal braces. Won’t they just bring more attention to your teeth? For adults in your situation, New Haven Dental Group has the perfect solution: Invisalign. Discreet, comfortable, and effective, this revolutionary system is the premier way people around the world are choosing to straighten their teeth. 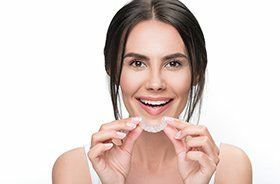 The reason Invisalign is so special is that instead of using brackets and wires to move the teeth, like all other orthodontic treatments, it instead utilizes a series of lightweight, see-through plastic aligners. A patient simply wears an individual set for about 2 weeks for 20-22 hours a day before moving onto the next, and once they have gone through the entire series, that’s it, their teeth will be perfectly straight. The trays are extremely thin and designed to be 100% clear, meaning they’re practically invisible while on the teeth. You’ll never have to worry about friends or coworkers noticing your treatment. Instead of a bunch of metal irritating the inside of your mouth, Invisalign’s smooth plastic sits easily against the lips, cheeks, and gums. Each tray is created using a 3D scan of your teeth to ensure the perfect fit. With regular braces, you have to alter your diet and brushing routine, but that isn’t the case with Invisalign. You can simply take the trays off whenever you like so you can maintain your daily habits without affecting your treatment. 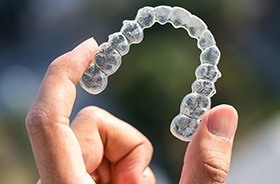 In many cases, Invisalign is able to straighten the teeth faster than traditional orthodontics. Most treatments only last about 12-18 months, while the average braces treatment time is well over 2 years! 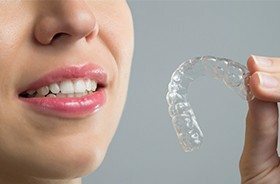 At this point, you’re probably thinking that Invisalign sounds great and all, but do you really need to go through the trouble and expense of straightening your teeth? Is it really worth the cosmetic benefit? While having a perfectly straight smile will certainly bolster your appearance, aligning your teeth has another advantage: improved oral health. When the teeth are spaced properly, they are much easier to clean compared to if they are crowded and mashed together. 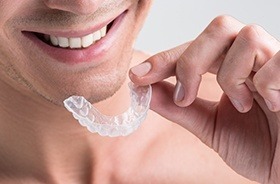 This means a patient can actually lower their risk of tooth decay with Invisalign, plus it can help line up the bite to improve overall oral function. With Invisalign, what you stand to gain goes well beyond what you can see. We typically recommend Invisalign only for patients who are 18 and up. Consistently wearing the trays requires a bit of self-discipline, and younger patients may still have developing teeth and jaws. To see if this treatment would be a good fit for you, the best thing to do is schedule a consultation here at New Haven Dental Group. We’ll give you a brief exam, go over your options, and if Invisalign is one of them, we can begin your treatment right away! To get started on your path to a straighter, more beautiful smile, contact us today.